The machines used in thermoplastic injection are injection moulding machines. They are used to create large and very large series of up to several thousand parts. The primary materials used are plastics and elastomers, as well as metals such as aluminium and brass. The injection moulding machine consists of several parts. Here are the principal ones: nozzle, mobile plate, fixed plate, heating collar, feed hopper, endless screw (or lamination screw), evacuation system, closing mechanism and console. In addition, the components of an injection molding press can be subdivided into two principal assemblies. 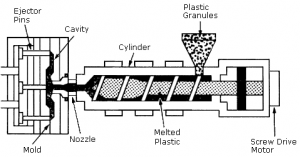 Firstly, there is a plasticising injection group. It allows several applications such as feeding of granules and melting of material, subsequently metered and injected under pressure. Secondly, there is a closing group. This makes it possible to lock, open and close the mould and eject the parts. This allows the material to be melted and transferred to the mould. The feeding of the plastic material in the form of granules is performed by the hopper. Then the heat present in the injection unit melts the plastic material (at temperatures of up to 200°C.). 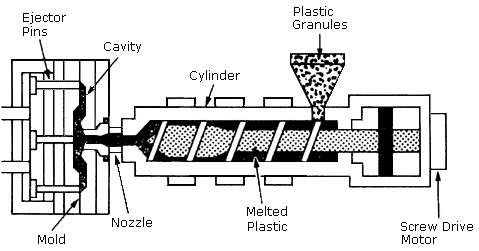 The endless screw subsequently allows the material to be moved into the injection barrel. It is also used to inject the liquid plastic into the mould under pressure. This injection occurs in two phases, the dynamic injection phase and the holding phase. The material is inserted into the mould cavities where it cools and solidifies. In parallel, the material is moved from the hopper towards the endless screw to allow the next injection. After cooling, the parts are removed from the mould by means of the ejectors. After removal of the parts, the moving part of the mould closes on the fixed part by means of the closure mechanism of the mobile plate. A new cycle can then be performed. Analysis of the plans of the parts according to several criteria (plans of gaskets, undercuts, closures, etc.). Creation of the tooling plan (2D and 3D files) according to the required specifications. Production of an aluminium or steel mould. Testing the tooling in an injection centre and development if necessary. Production of parts in large quantities using an injection moulding machine. Tonnage of the production capacity. Injection moulding press or overmoulding press. Horizontal press or vertical press. Hydraulic solution or electrical solution. Parts obtained: Parts made with thermoplastic injection are series parts. Since they are produced with the right material, they offer a good finish. They are visual and functional. Thermoplastic injection is used for various sectors such as automotive or household appliances. If you are doubtful about which technology is best suited to your needs and want more information, consult our pages to identify your needs and our technologies. Do not hesitate to let us know about your project. We will be able to advise you.